Attributing his early release to the UP government being 'scared' of a rebuke from the Supreme Court, the Bhim Army chief speculated that fresh charges could be framed against him within ten days. 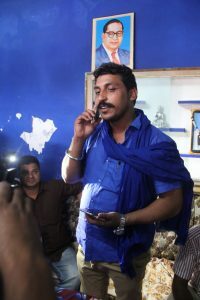 New Delhi: After he was released early on Friday morning from Saharanpur jail, Bhim Army chief Chandrashekhar Azad has spoken out against the BJP, the ruling party both at the Centre and in Uttar Pradesh. “Voting for the BJP is jeopardising your future generations. Now I have come back, I will appeal to everyone in the country that they should not vote for BJP in 2019 under any circumstance,” Azad told reporters. “They did not allow me to be treated when I was unwell in jail. They did not allow me to meet my family. Was not given proper food. They committed atrocities against us in jail. Whatever they did to us, we will return to them with interest in 2019,” Azad added. Azad also said the UP government decided to release him before November 1, when the application of the National Security Act against him would have lapsed, as it was “scared” of a reprimand from the Supreme Court. “Government was so scared that they are going to be rebuked by the Supreme Court, that they ordered an early release to save themselves. I’m confident they’ll frame some charges against me within ten days: I’ll ask my people to throw BJP out of power in 2019,” Chandrashekhar told ANI. Commenting on his own political future, “Chandrashekhar will not contest the elections,” he said referring to himself in the third person.